Romance has permeated the Big Apple, with discount Once tickets now available for the Broadway production. The sweet romantic tale entwined with award-winning music has been a hit both on the big screen and the live stage. 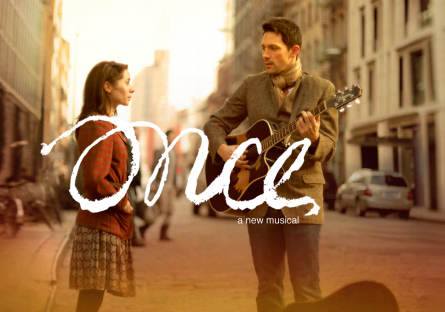 Now is your chance to catch the story of an Irish street musician and a Czech immigrant who find one another through the beauty of the music they make together. Cheap Once tickets are now available at the Bernard B. Jacobs Theatre in the Broadway district, where the show is currently scheduled to run through most of 2013. Discount Once ticket holders are immersed in the world of an Irish musician (Guy) trying to get a break by playing in a local bar in Dublin. One night Girl walks into the bar, and begins questioning him about his songs. Through a sweet, and sometimes strange, turn of events, the two partner together for one week in an effort to record a demo tape together. Of course, the pair fall in love over the course of that single week, but their ability to act on their feelings is mired throughout the show by a long list of complications. Throughout the story, the music is intertwined in a natural way that is very different from the typical show-stopping numbers of typical Broadway musicals. This intimate show draws the audience right onstage with the performers, as though you are hearing the tale from the warmth and comfort of an Irish pub. Get your cheap Once tickets now and don’t miss this award-winning musical. This entry was posted in Broadway Tickets and tagged cheap Once Tickets, didscount Once Tickets, Once Tickets. Bookmark the permalink. All rights reserved. By accessing or using the Site, you signify that you have read, understand and agree to be bound by Goodseattickets terms and policies. Goodseattickets is not the ticket seller and in no way affiliated to any venue or box office.